I am pleased to say that my daughter’s wedding invitation, printed and assembled by Cortineo Creative’s Wedding Studio in Doylestown, and in which I had a hand in designing, has received the Neographics award for Best Invitation in the category ‘Small Press 1, 2 or 3 Color’ this year. Neographics is a graphic communications contest for the PA, NJ and Delaware area in which graphic arts, packaging, design and publishing excellence is selected and showcased. My daughter, multimedia writer and videographer Julie Achilles Benns, chose her wedding decor to fit her themes of Art Deco and New Year’s Eve, the date her wedding was celebrated. The invitation was truly a collaboration in design and execution between The Wedding Studio and us. Julie and I worked out a basic design in black and white for the front of the wedding invitation; Julie wanted to incorporate the idea offered to us by Lori at The Wedding Studio, of a lasercut paper overlay to be hand-applied once the invitations were printed. We designed an original custom overlay. Julie created the vector file and we used Paper Presentation in NYC to lasercut an elegant, very Deco style frame in burnished gold paper. Kelly, our designer at The Wedding Studio, chose handsome fonts and designed the rest of the invitation package, with a coordinating gold pocket to hold the waterfall-cut insert cards. The final invitation was printed on white stock with black and metallic gold ink, with a white envelope and a gold liner. Cortineo Creative did a stellar job of printing and assembling the invitations, which was evidently noticed by the judges at Neographics! I wrote in more detail on the entire process on my previous post here, and Cortineo announced the honor on their blog here. I’m so pleased to announce that my painting of the Benjamin Parry Mansion for the children’s book Let’s Visit New Hope, by Gayle Goodman and Roy Ziegler, has been accepted into the 30th Annual Bucks Fever Exhibit. The exhibit’s theme is “Celebrating Bucks County Architecture” and is sponsored by the Central Bucks Chamber of Commerce and William and Laurie Schutt. The opening reception is Thursday, April 7 from 5:00 to 7:00 pm at the Wellness Center, 847 Easton Road, Warrington, and the show continues through April 21. Admission is free and further info is available at 215-348-3913. I thank the Chamber and the exhibit committee for including art that can be enjoyed by children as well as adults. My book illustration shows a family visiting the Parry Mansion in New Hope and taking note of the landmark Lenape Indian just outside the historic house, with Ben Parry himself, who acts as ‘tour guide’ in the book, looking out the door. I visited Parry Mansion just a few days ago for the 259th anniversary of Benjamin Parry’s birthday, celebrated by the New Hope Historical Society, which maintains the lovely home. The house was built by Parry in the 1770s and several generations of his family lived there. The Historical Society has many original artifacts and donated period pieces of furniture throughout the house, and I highly recommend touring the house if you are in the area. 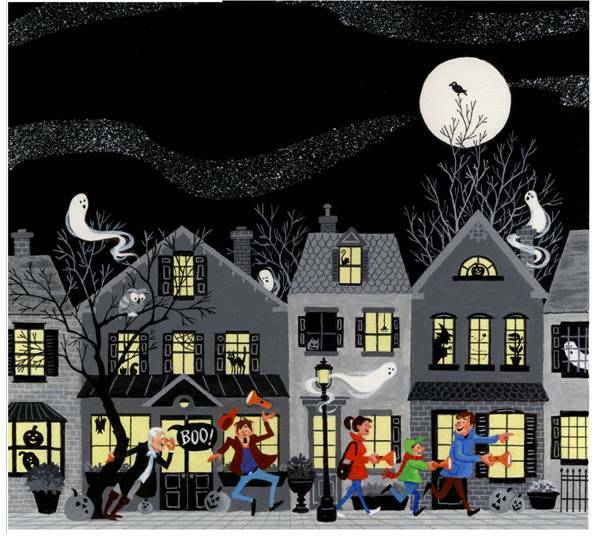 I am very honored and grateful to the Philadelphia Sketch Club and the judges for Phillustration 7, for awarding my illustration “Ghost Tour” First Place in the Book Illustration category this year. I painted this piece last fall for the children’s book Let’s Visit New Hope, written by Gayle Goodman and Roy Ziegler and sponsored by the New Hope Historical Society. There were no shortage of terrific illustrations in this year’s show in several different categories. Other members of the Bucks County Illustrators Society, of which I’m a co-founder, also had outstanding work exhibited, including Glenn Zimmer, Deb Hoeffner, Pam Hamilton, and Rebecca Rhodin. Joe DeVito served as one of this year’s judges and his pencil concept sketches for a King Kong project he is working on were also prominently featured. The Sketch Club is a venerable Philadelphia institution, having started in the 1860s, and is considered the oldest continuously running organization for artists in the country. Outstanding painters and illustrators of the past who have been members include Thomas Eakins, N.C. Wyeth, Henry Pitz, Walter Baum, Edward Redfield, Daniel Garber; and Ranulph Bye, among many others. Sketch Club President Rich Harrington and the staff created a varied and exciting exhibit that I recommend to everyone who enjoys ‘fine art that tells a story’ – which is how good illustration is defined. I am thrilled and grateful to receive this recognition, and thankful also to authors Gayle and Roy for writing the book that inspired my illustration! The Sketch Club is located at 235 S. Camac Street in Philadelphia, and this show is up until November 27, with gallery hours Wednesday, Friday, Saturday and Sunday from 1:00 pm to 5:00 pm.